The November 25th death of Fidel Castro has prompted comments from President-Elect Donald Trump and his aides, the Obama Administration, U.S. Senators and Representatives, U.S. editorial boards and columnists and U.S. business interests and others. All of this has fueled speculation about the future Trump Administration’s policies regarding Cuba. These topics will be explored in this post along with this blogger’s observations. These comments were corroborated by Trump’s top aides. On Sunday, November 27, two of the aides said that Trump would demand the release of political prisoners held in Cuba and push the government to allow more religious and economic freedoms. Reince Priebus, the incoming White House chief of staff, said the president-elect “absolutely” would reverse Mr. Obama’s policies if he didn’t get what he wanted from Cuba. “We’re not going to have a unilateral deal coming from Cuba back to the [U.S.] without some changes in their government. Repression, open markets, freedom of religion, political prisoners—these things need to change in order to have open and free relationships, and that’s what president-elect Trump believes, and that’s where he’s going to head.” Similar comments were made the same day by Trump’s spokeswoman, Kellyanne Conway. President Barack Obama’s statement extended the U.S. “hand of friendship to the Cuban people” and stated that “history will record and judge the enormous impact of this singular figure on the people and world around him.” According to the President, Cubans “will recall the past and also look to the future. As they do, the Cuban people must know that they have a friend and partner” in America. The next day, November 28, Press Secretary Ernest announced that the U.S. will not send a formal delegation to Cuba to attend the Castro funeral but instead will dispatch a top White House aide and a principal Cuba-normalization negotiator, Benjamin J. Rhodes, to be joined by , the top U.S. diplomat in Cuba. Senator Marco Rubio of Florida, a Cuban-American and Republican presidential candidate this year, said in a statement: “Sadly, Fidel Castro’s death does not mean freedom for the Cuban people or justice for the democratic activists, religious leaders, and political opponents he and his brother have jailed and persecuted. The dictator has died, but the dictatorship has not…The future of Cuba ultimately remains in the hands of the Cuban people, and now more than ever Congress and the new administration must stand with them against their brutal rulers and support their struggle for freedom and basic human rights.” Senator Bob Menendez (Dem., N.J.), a Cuban-American who has opposed Mr. Obama’s policy, issued a similar statement. First, many U.S. companies are now deeply invested in Cuba under the current administration’s policy. These companies include major airlines, hotel operators and technology providers, while big U.S. phone carriers have signed roaming agreements on the island. “I think the American business community would be strongly opposed to rolling back President Obama’s changes, and strongly in favor of continuing the path toward normalization of economic and diplomatic relations,” said Jake Colvin, vice president of the National Foreign Trade Council. Second, the U.S. farming industry is strongly supportive of normalization of U.S.-Cuba relations. For example, Kevin Paap, president of the Minnesota Farm Bureau, does not want the next administration to take any steps that would put U.S. farmers at a further disadvantage in the Cuban market. “Every other country in the world has diplomatic and trade relations with Cuba, and what we don’t want to do is lose that market share to the European Union, Brazil, Argentina.” Mr. Paap added that U.S. market share in Cuba has decreased in recent years as other countries are able to provide better financing. But agricultural producers across the country, from rice producers in Louisiana to Northwest apple farmers to Kansas wheat growers have pushed for more, including lifting a ban prohibiting Cuba from buying American agricultural goods with U.S. credit. Republican governors from Texas, Arkansas and elsewhere have led trade delegations to Cuba, along with their state farm bureaus and chambers of commerce. Meanwhile in faraway Minnesota, even though it has relatively few Cuban exiles, celebrated its Cuban connections. They range from festivals and restaurants in the Twin Cities that preserve and highlight Cuban culture. Its politicians in Washington, D.C. have been leaders in efforts to lift the trade embargo on Cuba, citing the potential for economic and political advancements and job growth. Christian communities in Minnesota also value their religious and moral obligations to Cubans. Cuba’s expanded Mariel Port could carry Minnesota-made goods. Other Minnesota-based companies, including Sun Country Airlines, Radisson Hotels and Cargill, could benefit from lifting the embargo. Last year the Minnesota Orchestra took a historic trip to Cuba as the first U.S. orchestra to perform there since Obama began negotiations in 2014. Next June, some Orchestra members will perform in Cuba again along with Minnesota Youth Symphonies. They also will be joined by Cuban-American jazz musician, Ignacio “Nachito” Herrera, and his wife, who works as an attorney. Herrera grew up during the Cuban Revolution and credits Castro’s leadership for the career opportunities he and his wife have achieved. Indeed, Herrera met Castro in the 1980s while being recognized in a Classic World Piano competition. Castro was humble, Herrera said, and deeply curious about his accomplishments. This blog consistently has applauded the U.S. pursuing normalization with Cuba. The death of Fidel Castro does not change that opinion and advocacy. Fundamentally I agree with President Obama that the 50-plus years of U.S. hostility towards Cuba has not worked—it has not persuaded or forced Cuba to change its ways and it has interfered with our having friendly relations with countries throughout the world, especially in Latin America. Indeed, the countries of the Western Hemisphere in their Summits of the Americas have made it clear to fellow member the U.S. that they would no longer reluctantly acquiesce in the U.S. desire to exclude Cuba from such Summits, and at the last such gathering in 2015, after the announcement of U.S.-Cuba normalization they praised both countries for this move. Opponents of normalization usually point to Cuban deficiencies on human rights and democracy. But such opposition fails to recognize or admit that the U.S. does not have a perfect record on these issues, including this year’s U.S. election and efforts at voter suppression and the U.S. indirect election of the president and vice president via the Electoral College. Moreover, such opponents also fail to recognize or admit that at least some Cuban limits on dissent and demonstrations undoubtedly are triggered by their fear or suspicion that the U.S. via its so-called covert or undercover “democracy promotion” programs in Cuba is financing or otherwise supporting these efforts at regime change on the island. Finally as part of the efforts at normalization the U.S. and Cuba have been having respectful dialogues about human rights issues. Another issue sometimes raised by opponents of normalization is Cuba’s failure to provide financial compensation to U.S. persons for Cuba’s expropriation of their property in the early years of the Revolution. But such criticism fails to recognize that Cuba has paid compensation to persons from other countries for such expropriation, that it is in Cuba’s interest to do the same for U.S. persons, that the two countries have been respectfully discussing this issue as well, and there is no reason to expect that this issue cannot be resolved peacefully. Opponents of normalization also seem to believe or assume that only the U.S. and Cuba are involved in these issues. That, however, is not true. Perhaps precipitated by the December 2014 announcement that Cuba and the U.S. had agreed to seek normalization and reconciliation, other countries, especially the members of the European Union, have been accelerating their efforts to resolve differences with Cuba so that the U.S. will not beat them to gain competitive advantages with the island. China also is another competitor. For the U.S., once again, to act like an arrogant bully towards Cuba will not achieve any good result. All U.S. citizens interested in Cuba’s welfare and having good relations with the U.S. need to resist any efforts by the new Administration to undo the progress of the last two years. Assoc. Press, Trump Slams Recount Push as ‘a Scam,’ Says Election Is Over, N.Y. Times (Nov. 26, 2016); Reuters, Trump Says He Will do All He Can to Help Cuban People, N.Y. Times (Nov. 26, 2016); Assoc. Press, Vice-President-Elect Pence Says ‘New Hope Dawns’ for Cuba, N.Y. Times (Nov. 26, 2016); Assoc. Press, Trump Aides Say Cuban Government Will Have to Change, N.Y. Times (Nov. 27, 2016); Flaherty, Trump aides say Cuban government will have to change, StarTrib. (Nov. 27, 2016); Schwartz & Lee, Death of Fidel Castro May Pressure Donald Trump on Cuba Promises, W.S.J. (Nov. 27, 2016); Mazzei, Trump pledges to ‘terminate’ opening to Cuba absent ‘better deal,’ Miami Herald (Nov. 28, 2016); Cave, Ahmed & Davis, Donald Trump’s Threat to Close Door Reopens Old Wounds in Cuba, N.Y. Times (Nov. 28, 2016). White House, Statement by the President on the Passing of Fidel Castro (Nov. 26, 2016); U.S. State Dep’t, Secretary Kerry: The Passing of Fidel Castro (Nov. 26, 2016); White House, Press Briefing by Press Secretary Josh Earnest, 11/28/16; White House, Press Briefing by Press Secretary Josh Earnest, 11/29/16; Harris, Obama to Send Aide to Fidel Castro’s Funeral, N.Y. Times (Nov. 29, 2016). Sen. For. Rel. Comm., Corker Statement on the Death of Fidel Castro (Nov. 26, 2016); Griffiths, Corker praises Trump as State Department speculation continues, Politico (Nov. 29, 2016; Sen. For. Rel. Comm, Cardin Statement on the Death of Fidel Castro (Nov. 26, 2016); Rubio, Rubio: History Will Remember Fidel Castro as an Evil, Murderous Dictator (Nov. 26, 2016); Menendez, Senator Menendez on Death of Fidel Castro (Nov. 26, 2016); Flake, Flake Statement on the Death of Fidel Castro (Nov. 26, 2016); Ryan, Statement on the Death of Fidel Castro (Nov. 26, 2016);The latest: US House Leader Urges Remembering Castro Cruelty, N.Y. Times (Nov. 26, 2016); Klobuchar, Klobuchar Statement on Passing of Fidel Castro (Nov. 26, 2016); Emmer, Emmer Statement on Death of Fidel Castro (Nov. 26, 2016). Editorial, Threatening Cuba Will Backfire, N.Y. Times (Nov. 29, 2016); Editorial,Editorial, Fidel Castro’s terrible legacy, Wash. Post (Nov. 26, 2016); Fidel Castro’s demise can’t guarantee freedom for the people of Cuba, Wash. Post (Nov. 28, 2016); Will, Fidel Castro and dead utopianism, Wash. Post (Nov. 26, 2016); Eire, Farewell to Cuba’s brutal Big Brother, Wash. Post (Nov. 26, 2016); Parker, Don’t give Fidel Castro the last laugh, Wash. Post (Nov. 29, 2016). Eire is the author of Learning To Die in Miami: Confessions of A Refugee Boy (2010) and Waiting for Snow in Havana (2003). DeYoung, Trump’s threat to terminate opening to Cuba may draw opposition from business, Republican states, Wash. Post (Nov. 29, 2016); Miroff, Cuba faces renewed tensions with U.S., but without Fidel Castro, its field marshal, Wash. Post (Nov. 28, 2016); Dube & Johnson, Donald Trump’s Line on Cuba Unsettles Latin America, W.S.J. (Nov. 28, 2016); Klobuchar, Minnesota Artists, Leaders Reflect on Castro’s Legacy (Nov. 26, 2016); Miroff & Booth, In wake of Castro’s death, his legacy is debated, Wash. Post (Nov. 28, 2016). See List of Posts to dwkcommentaries—Topical: CUBA. Previous posts have discussed the Seventh Summit of the Americas in April 2015. https://dwkcommentaries.com/?s=Summit+of+the+Americas. Previous posts have discussed the U.N. General Assembly resolutions on the embargo in 2011, 2014, 2015 and 2016 and the suggested international arbitration to resolve the disputes about Cuba’s damage claims resulting from the embargo. (See posts listed in “U.S. Embargo of Cuba” section of List of Posts to dwkcommentaries—Topical: CUBA. See posts listed in “U.S. Democracy Promotion in Cuba,” “U.S. & Cuba Normalization, 2014-2015” and “U.S. & Cuba Normalization, 2015-2016” sections of List of Posts to dwkcommentaries—Topical: CUBA. See posts listed in “U.S. & Cuba Damage Claims” section of List of Posts to dwkcommentaries—Topical: CUBA. See list of posts in “Cuba & Other Countries” section of List of Posts to dwkcommentaries—Topical: CUBA. A prior post reviewed the Justice Against Sponsors of Terrorism Act (JASTA) (S.2040) that was passed by Congress on September 28, 2016, with sufficient votes to override President Obama’s veto of the bill. Now we look at the pre-veto legislative history of JASTA and controversies over the bill. S.2040 was introduced in the U.S. Senate on September 16, 2015, by Senator John Cornyn (Rep., TX) with 12 Republican and 12 Democrat cosponsors. Without any hearings on the bill, the Senate Judiciary Committee on January 28, 2016, passed an amendment as a substitute for the original bill, and on February 3, 2016, the Committee Chair, Senator Charles Grassley (Rep., IA), reported the bill to the Senate without a written report. On May 17, 2016, the Senate unanimously passed the JASTA bill with limited debate. On the Senate floor Senator Cornyn offered a substitute amendment and stated that the U.S. Code already had an exception to sovereign immunity for certain acts of terrorism [28 U.S.C. § 1605A], but “it does not extend to terrorist attacks on our homeland by countries and organizations that have not already been designated as state sponsors of terrorism. This [bill] makes some small changes in that legislation that first passed in 1976 to expand the scope of that [provision] to allow the families of the 9/11 tragedy to seek justice in our courts of law.” The bill has been limited to “injury in the United States.” The bill requires injuries caused by “acts of terrorism,” and excludes “acts of war.” Cornyn also discussed the secondary liability provision of the bill. On October 23, 2015, an identical companion bill (H.R.3815) was introduced in the U.S. House of Representatives by Representative Peter King (Rep., NY) with 31 Republican and 30 Democrat cosponsors. It was referred to the House Judiciary Committee, which did not hold any hearings on the bill. On September 9, 2016, the Senate companion bill (S.2040) was agreed to and passed by a voice vote in the House. The Senate passage of JASTA, on May 17, 2016, was despite lobbying against the bill by Administration officials and warnings by the Saudi government that if the legislation passed, that country might begin selling off up to $750 billion in U.S. Treasury securities and other assets in the U.S. before they faced the danger of being frozen by American courts. A journalist said that these 28 pages set forth “a wide-ranging catalog of meetings and suspicious coincidences. It details contacts between Saudi officials and some of the Sept. 11 hijackers, checks from Saudi royals to operatives in contact with the hijackers and the discovery of a telephone number in a Qaeda militant’s phone book that was traced to a corporation managing an Aspen, Colo., home of Prince Bandar bin Sultan, then the Saudi ambassador to Washington.” The 28-pages also said, ”It was not the task of this Joint Inquiry to conduct the kind of extensive investigation that would be required to determine the true significance of any such alleged connections to the Saudi Government. . . [But the Committee found no evidence that the] “Saudi government as an institution, or senior Saudi officials individually funded” Al Qaeda. Some former September 11 Commission staff members, however, pointed out that the wording in the group’s final report did not rule out the possibility that lower ranking Saudi officials had assisted the hijackers. Senator John Cornyn, the author of the bill, however, started a barrage of comments urging President Obama to sign the bill by saying on September 9, “the families of those lost in attacks like that on September 11th should have every means at their disposal to seek justice. . . . I hope the President will sign it into law.” On the Senate floor on September 12 Cornyn said: “It’s important for us to send a message that that evil shall not prevail. . . . [The] victims [of 9/11] and their families still don’t have the ability to get justice from the people, including the governments, who helped fund those terrorist attacks. And that’s where the bill . . . [JASTA] comes into play because if this legislation is signed by the President, it will become the law of the land . . . to make sure that these families who are still grieving and still don’t have closure will be able to seek justice in a court of law against the people who killed their loved one on September 11th.” Cornyn on September 13 threatened an override of a presidential veto of the bill. President Obama, however, did not sign the bill into law. Instead, On September 23, he vetoed the bill as will be discussed in a subsequent post. Library of Congress, THOMAS: S.2040 Justice Against Sponsors of Terrorism Act . Going back to 2009, earlier versions of this law were introduced, but I have not examined the history of those versions. If a reader of this post has done so, please elaborate in a comment to this post. Cong. Record S2845-48 (May 17, 2016); Mazzetti, Senate Passes Bill Exposing Saudi Arabia to 9/11 Legal Claims, N.Y. Times (May 17, 2016). U.S. Cong. Rec. S2845-2848 (May 17, 2016). Schumer, Schumer Announces Passage of Justice Against Sponsors of Terrorism Bill—Urges House to Quickly Pass Legislation Allowing American Families To Seek Justice After 9/11 Attacks (May 17, 2016); Schumer, Schumer Urges House To Swiftly Pass JASTA Bill; Law Would Allow Victims To Seek Justice for Terrorist Acts on U.S. Soil, Senator Says American Families Deserve Their Day in Court (Sept. 7, 2016). Cong. Record H5239-44 (Sept. 9, 2016); Library of Congress, THOMAS: H.R.3815 Justice Against Sponsors of Terrorism Act. Mazzetti, In 9/11 Document, View of a Saudi Effort to Thwart U.S. Action on Al Queda, N.Y. Times (July 15, 2016); House/Senate Select Comm., 28 Pages of the 2002 Congressional Inquiry into the Sept. 2011 Attacks, N.Y. Times (July 15, 2016). White House, Press Briefing by Press Secretary Josh Earnest (July 15, 2016). Steinhauer, House Passes Bill Allowing 9/11 Lawsuits Against Saudi Arabia; White House Hints at Veto, N.Y. Times (Sept. 9, 2016). Cornyn, Cornyn Calls on President to sign 9/11 Victims Bill (Sept. 9, 2016);Cornyn, Cornyn: American People Support 9/11 Victims Bill (Sept. 12, 2016); Cornyn, Cornyn to White House: Don’t Keep 9/11 Families Waiting (Sept. 13, 2016); Cornyn, Cornyn Presses White House to Act on 9/11 Victims Bill (Sept. 19, 2016); Cornyn, Cornyn to White House: Stop Stalling on 9/11 Bill (Sept. 20, 2016). As discussed in a prior post and two comments thereto, the United States and Turkey continue to be involved in discussions regarding Turkey’s request for the U.S. to extradite to Turkey a Muslim cleric, Fethullah Gulen, who now is living in the U.S. The subject also came up with respect to U.S. Vice President Joe Biden’s August 24 visit to Turkey: first in the White House Press Secretary’s August 22 press briefing; second in Biden’s August 24 joint press conference with Turkey’s Premier Binali Yildirim; third in Biden’s August 24 joint press conference with Turkey’s President Recep Tayyip Erdogan; fourth at the White House Press Secretary’s August 24 press briefing; and fifth at the State Department’s August 24 Daily Press Briefing. Upon his arrival in Ankara, Biden and Turkey’s Premier Yildirim held a joint press conference. To the right is a photograph of them. Vice President Biden, President Obama and other U.S. officials consistently and rightly have emphasized that Turkey’s requested extradition of Gulen will be handled in accordance with the U.S.-Turkey extradition treaty and U.S. law, which were explained in a prior post and which were illustrated in February 6 and August 22 posts about the ongoing proceedings for extradition of a former Salvadoran military officer to Spain for the criminal case regarding the 1989 murder of the Jesuit priests. Turkey’s refusal to make a public acknowledgement of this reality cannot be based on ignorance of its extradition treaty or U.S. law. Instead it has to be based in part on Erdogan’s wanting to appear to the Turkish people as a strong leader and fomenting Turkish public pressure for the extradition. Perhaps too it is based upon Erdogan’s apparently increasing belief in his own power to control everything. Yes, the editorial accurately quotes Article 9, but that Article states the obligation to detain arises only “after the information and documents related to the request for extradition have been received” (here, by the U.S.). The published reports indicate that some information and documents regarding Gulen have been provided to the U.S. by Turkey, but it is unclear if Turkey has completed that process. Moreover, as indicated above, the U.S. is meeting with Turkish officials to aid them in providing the necessary materials for the application. The editorial also fails to examine Article 10(1) of the treaty, which provides, “In cases of urgency, either Contracting Party may apply for the provisional arrest or detention of the person sought before the request for extradition has been submitted to the Requested Party through diplomatic channels. The request for provisional arrest or detention may be made either through diplomatic channels or directly between the Department of Justice of the United States and the Ministry of Justice of Turkey.” Article 10(2) then goes on to list what needs to be in such an application. Public information has not indicated that Turkey has availed itself of this remedy. Relevant here, but unacknowledged by the Daily Sabah, is the U.S. Attorneys’ Manual that covers the procedures for detention or arrests of persons potentially subject to extradition in these situations. Therefore, the Daily Sabah editorial, in this blogger’s judgment, is not well founded. Press Briefing by Press Secretary Josh Earnest, 8/22/16. White House, Remarks by Vice President Joe Biden and Turkish Prime Minister Binali Yildirim at a Press Availability (Aug. 25, 2016); Reuters, Biden Says U.S. Cooperating With Turkey on Evidence Against Gulen, N.Y. Times (Aug. 24, 2016); Assoc. Press, Biden Calls on Turkey to Be Patient in Gulen Case, N.Y. Times (Aug. 24, 2016); Kraychik, Biden Apologizes To Turkey For US Constitution, Daily Wire (Aug. 24, 2016). White House, Remarks by Vice President Biden and President Erdogan of Turkey in Pool Spray (Aug. 25, 2016); Reuters, Biden Tells Turkey’s Erdogan: Only a Federal Court Can Extradite Gulen, N.Y. Times (Aug. 24, 2016); Reuters, Turkey Must Control Its Own Border, U.S. Vice President Biden Says, N.Y. Times (Aug. 24, 2016); Reuters, Turkey’s Erdogan Says U.S. Agreements Require Coup Suspect Arrest, N.Y. Times (Aug. 24, 2016); Wayne & Sink, Biden Met by Snubs as He Seeks to Mollify Turkey’s Angry Erdogan, Bloomberg News (Aug. 24, 2016). Press Briefing by Press Secretary Josh Earnest, 8/24/16; Reuters, U.S. Reviewing Turkey’s Evidence on Coup Suspect Gulen: White House, N.Y. Times (Aug. 24, 2016). U.S. State Dep’t, Daily Press Briefing (Aug. 24, 2016). See also Assoc. Press, U.S., Turkey at an Impasse Over Extraditing Muslim Cleric, N.Y. Times (Aug. 25, 2016). U.S.-Turkey Extradition Treaty, 32 U.S.T. 3111. U.S. Attorneys’ Manual § 9-15.700. 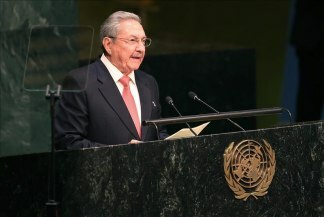 Over the last week Cuban President Raúl Castro has made two speeches at the United Nations in New York City as has U.S. President Barack Obama. Afterwards the two of them with advisors held a private meeting at the U.N. with subsequent comments by their spokesmen. Here is a chronological account of these events. Later in the speech, Obama added these words: “Think of the Americans who lowered the flag over our embassy in Havana in 1961 — the year I was born — and returned this summer to raise that flag back up. (Applause.) One of these men said of the Cuban people, “We could do things for them, and they could do things for us. We loved them.” For 50 years, we ignored that fact. The rest of this Castro speech argued that the U.N. has failed in its 70 years of existence to fulfill the lofty purposes of its Charter. The speech also noted Cuba’s solidarity with its Caribbean brothers, African countries, the Bolivarian Republic of Venezuela, the Republic of Ecuador, the people of Puerto Rico, the Republic of Argentina, the Brazilian people and President Dilma Rouseff, the Syrian people and the Palestinian people. Castro also supported the nuclear agreement with the Islamic Republic of Iran. On the other hand, Castro reaffirmed Cuba’s “rejection of the intention to expand the presence of NATO up to the Russian borders, as well as of the unilateral and unfair sanctions imposed on that nation” and Cuba’s condemnation of NATO and European countries’ efforts to destabilize countries of the Middle East and Africa that have led to the recent migrant crisis in Europe. The two presidents with their advisors held a 30-minute private meeting at the U.N. on Tuesday, September 29. The photograph at the left shows them shaking hands. The U.S. delegation consisted of Secretary of State, John Kerry; National Security Adviser, Susan Rice; National Security Council Senior Director for Western Hemisphere Affairs, Mark Feierstein; and the U.S. Permanent Representative to the U.N., Samantha Power. Cuba’s delegation was composed of the Foreign Minister, Bruno Rodriguez; Consultant, Alejandro Castro Espin (the son of President Raúl Castro); Vice President of Cuba’s Defense and Security Committee, Juan Francisco Arias Fernández; Cuba’s Director General of U.S. Affairs, Ministry of Foreign Affairs, Josefina Vidal; and Cuba’s Ambassador to the U.S., José Ramón Cabañas. Soon after the presidential meeting, Cuban Foreign Minister Bruno Rodriguez held a press conference at the U.N. In his opening statement, he said that in a “respectful and constructive” atmosphere, the two presidents exchanged their views on the recent visit of Pope Francisco to Cuba and the United States, as well as issues on the bilateral agenda established between the two countries. President Castro affirmed Cuba’s desire to build a new relationship with the U.S. based on respect and sovereign equality, but reiterated that to have normal relations the U.S. had to lift the blockade, which is causing damage and hardship to the Cuban people and affects the interests of American citizens. Castro also confirmed that Cuba on October 27 would introduce in the General Assembly a resolution condemning the embargo (blockade). Said the foreign Minister, the blockade is “a massive, flagrant and systematic violation of human rights of all Cubans and harms all Cuban families, even Cubans living outside Cuba.” Cuba fully expects this year’s resolution to once again have overwhelming support. The Foreign Minister said the return of the territory illegally occupied by the Guantanamo Naval Base in Cuba is a high priority element in the process of normalization of relations between the U.S. and Cuba, as a vindication of Cuban people. At another point he added that “we are very proud of the accomplishments of Cuba on human rights and that human rights are universal, not subject to political selectivity or manipulation of any kind. ” Cuba guarantees the full exercise of political rights and civil liberties, and economic, social and cultural rights. We have many concerns with the situation on human rights in the world, particularly in the U.S. and Western Europe, as illustrated by the current immigration refugee crisis. The pattern of racial discrimination and police brutality against African Americans in the [U.S.] is really serious. Cuba reiterated its insistence on ending the U.S. embargo as an essential condition for normalization of relations, an objective shared by President Obama and this blog. We now await the U.N. General Assembly’s debate and anticipated approval on October 27 of another resolution condemning the embargo and whether the U.S. will, for the first time, abstain on the vote. Cuba continues to assert that the U.S. lease of Guantanamo Bay is illegal, but its saying so does not make it so. Previous blog posts have discussed this contention and do not find it persuasive and, therefore, suggested the two countries submit the dispute for resolution to the Permanent Court of Arbitration at The Hague in the Netherlands. The same means has been suggested in this blog for resolving the disputes about whether or not Cuba has been damaged by the embargo (blockade) and the amount of such alleged damages as well as the amount of damages to U.S. interests by Cuba’s expropriation of property in the early years of the Cuban Revolution. White House, Remarks by President on Sustainable Development Goals (Sept. 27, 2015). Reuters, Quotes from President Obama’s U.N. 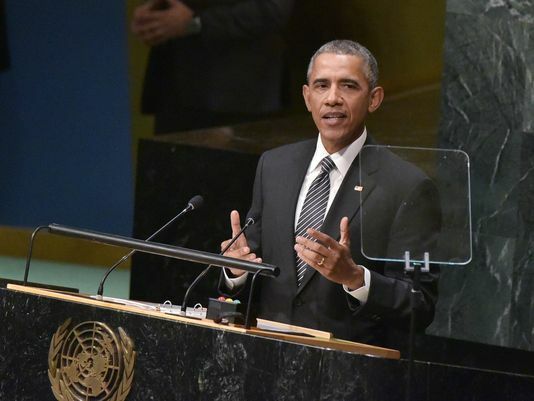 Speech, N.Y. Times (Sept. 28, 2015); President Obama’s Speech to the United Nations General Assembly 2015, N.Y. Times (Sept. 28, 2015); White House, Remarks by President Obama to the United Nations General Assembly (Sept. 28, 2015). Raúl at the United Nations: The International community can always count on Cuba’s voice in the face of injustice, Granma (Sept. 28, 2015); Full text [of Castro’s speech], Granma (Sept. 28, 2015); Reuters, At U.N., Castro Says U.S. Must End Embargo to Have Normal Cuba Ties, N.Y. Times (Sept. 28, 2015); Assoc. Press, Raúl Castro Addresses General Assembly, N.Y. Times (Sept. 28, 2015) (video); Goldman, At the U.N., Raúl Castro of Cuba Calls for End to U.S. Embargo, N.Y. Times (Sept. 28, 2015). A prior post reviewed last year’s General Assembly’s condemnation of the embargo. White House, Press Gaggle by Press Secretary Josh Earnest en route Washington, D.C., 9/29/15; White House, Readout of the President’s Meeting with Cuban President Raul Castro (Sept. 29, 2015). 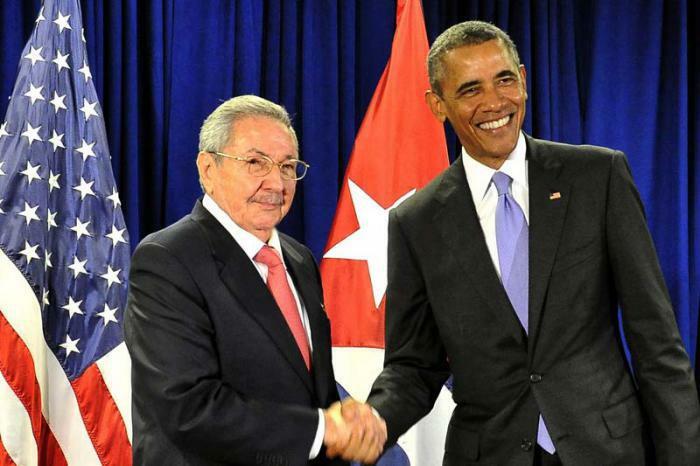 Reuters, Cuban Minister on Obama-Castro Meeting, N.Y. Times (Sept. 29, 2015) (video); Bruno Rodriguez: The blockade is a massive, flagrant and systematic violation of human rights, Granma (Sept. 30, 2015). This blog has discussed the initial bills to end the embargo in the House and Senate as well as later bills to do the same in the Senate and House. Resolution of U.S. and Cuba’s Damage Claims (April 4, 2015); Resolution of Issues Regarding U.S.-Lease of Guantanamo Bay (April 6, 2015); Does Cuba Have a Right to Terminate the U.S. Lease of Guantanamo Bay? (April 26, 2015).